In previous posts, I looked at how variance affects players who play large-field MTTs, smaller-field MTTs, and NLHE 6-max cash. Now, I thought I’d grab some low-hanging fruit in the form of sit-n-gos. It turns out that 9-handed and 6-handed STTs are very similar statistically, so I’ll lump them together below (I justify this in my assumptions section). HU SnGs are next in line, and should be done in a day or two (no promises). I’m only going to consider Poker Stars $114 9-mans and $119 6-mans. Some sites have different payout structures. In particular, some sites spread 10-mans and/or 5-mans instead, which obviously changes the payout structure and changes the numbers as well. This analysis will still give a decent picture for all roughly similar games, but keep in mind that it is explicitly an analysis of the Stars $114s and $119s. I’m going to assume normality. STTs are pretty close to normal over samples of 100+ tourneys and essentially indistinguishable over 500+ tourneys, so that shouldn’t be a problem. This follows directly from properties of the binomial distribution. I’m going to assume constant standard deviations. In theory, standard deviation for an STT player is dependent on her win distribution. 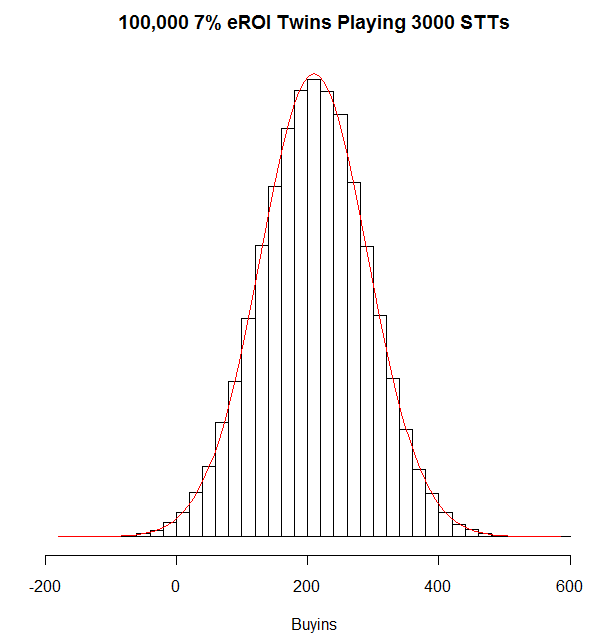 So, players with different ROIs can be expected to have different standard deviations, and even players with the same ROI could have different standard deviations. In practice, these effects are tiny: Standard deviations vary by only about 20% in 9-man STTs and only about 10% in 6-max STTs over reasonable finish distributions for serious players. I’m not looking to estimate confidence intervals within 10 or 20%, so this should be fine. I’m going lump 9-man and 6-man SnGs together, with a 1.5 BIs/tourney standard deviation for both 6-max and 9-man STTs. I didn’t initially plan on doing this, but it turns out that the numbers are almost identical for the two. Typical standard deviations are about 0.05 BIs/tourney higher for 9-man STTs and about 0.05 BIs/tourney lower for 6-man. So obviously this approximation is good enough for my purposes. (Of course, if you know basic statistics, everything in this post is derivable easily from the above. So, the real meat of this post is contained in the assumptions, which are all justified by a bit of behind-the-scenes research with sharkscope and windows calculator and some discussions with friends of mine. The rest is essentially just watching me divide by SQRT(n) and plug in to my favorite z-score calculator repeatedly)[/slider]. 1k STTs isn’t that many, either. 9-man STTs take something like 45 minutes to finish, so if you 12-table them in sets, you can play that many in 60 or 70 hours, i.e. less than a month of work for a not-too-lazy grinder. If you play them continuously, it will only take about 40 hours. (Keep in mind that multitabling STTs is much easier than multitabling cash games–especially if you play in sets. Based on almost nothing, I’d say that 12-tabling 9-man STTs in sets is roughly equivalent to 6-tabling cash.) Plenty of people 20-table these things continuously and can play 1k in like 25 hours. So if you play the $114s on Stars for a living and you’re pretty good, you can lazily grind out about $8k/month with very little variance. If you’re a good multitabler as well, you might make that in a little more than a week. Sick, right? But, how accurately can an STT pro know his effective ROI? Well, over 1k STTs, she certainly won’t be able to figure it out very accurately through statistics. A player whose skill should result in a 2% eROI has about a 15% chance of having a 7% eROI over 1k tourneys. So, if you earn as much as the above player over 1k STTs, it’s perfectly plausible that your actual equity was less than 1/3 of what you got. Indeed, the 95% confidence interval over 1k tourneys spans about 18% (e.g. from -9% to 9% eROI). Not surprisingly, life is even better. Only about 0.5% of them lose money over that sample. Almost 90% of them earn at least 105 buy-ins (1/2 of their equity of 210 buy-ins). So if you’re a solid STT professional, you can lazily grind out the $114s and have an expectation of almost $24k every two or three months (depending on the extent of your laziness) with almost no chance of losing money over that period. If you can achieve similar results at higher stakes (and some do), multitable well (Many do this as well), and/or be less lazy (much less common), you can make more than almost anyone with a salary at these things with pretty minimal variance on a relatively small bankroll. Cool, huh? But can you estimate your eROI well enough to be sure that you can pull that off? Well, you can get some rough approximations. 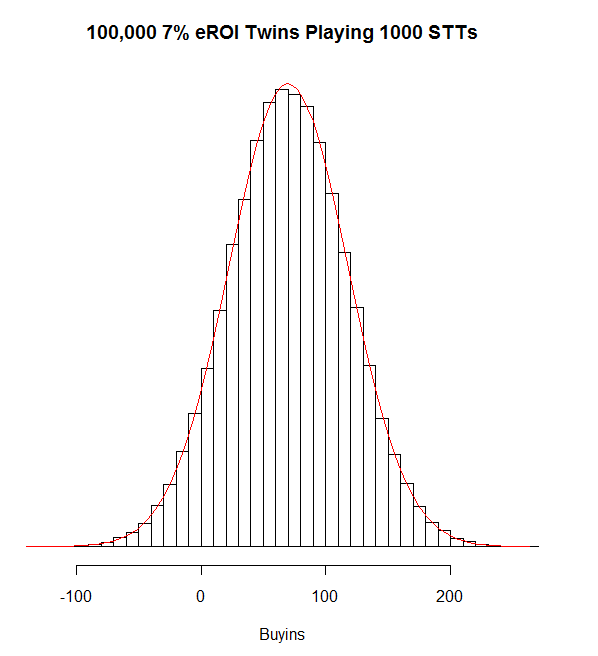 For example, a 3% eROI player only has about a 7% chance of winning as much as a 7% eROI player, so if you pull off a 7% eROI over 3k STTs, you can be fairly confident that your real eROI is at least 3% (and basically certain that you’re a winner). The 95% confidence interval still spans almost 11% (e.g. from -3% to 8% eROI), so you’re not going to get much useful information at that level of confidence. But, the 75% confidence interval spans about 6% (e.g. from 0% to to 6% eROI). That ain’t great, but it’s something. If you want to be 95% confident within 2% (e.g. 4% +/- 2% or 2% to 6%), you need to play over 20k STTs. Of course, that’s a ton, and by the time you’ve played that many, your eROI will likely be significantly different from when you started. Even if you want just 75% confidence, you need to play almost 7,500. For a 75% confidence interval of +/- 1%, you need to play almost 30k! So, just like with cash games (and certainly MTTs, though I didn’t even bother to point that out there), estimating your expected earn in STTs statistically to the degree of confidence that one would like is basically impossible. STTs pros can get a very rough idea, though. I.e. they might be able to distinguish between a decent winner and a loser or between a huge winner and a marginal winner. But, that’s about it. However, STTs do have the advantage of being much simpler than cash games or MTTs. (That’s probably more of a compliment than an insult, STT pros.) In my cash games post, I discussed estimating your winrate by aggregating the data of a bunch of similarly skilled players over a few months to estimate, but I pointed out that guaging your own skill level and the skill levels of others in cash games is quite difficult. It’s a lot easier for STTs because they are so much simpler (and much closer to being completely solved). So, I think that this method could be quite useful for STT players. You might, for example, combine the samples of various friends with whom you discuss strategy and use that to estimate your own ROI (and add in rakeback, bonuses, etc. to get your eROI). Of course, this requires a healthy level of objectivity about your own abilities, and many poker players are simply incapable of being honest with themselves on that front. Even as a 4% eROI player (e.g. a marginal winner before rakeback and bonuses, a break-even player with great rakeback and bonuses, or a solid player with no rakeback), things ain’t so great. Over 1k tourneys, you have a 20% chance of losing and a 34% chance of earning less than 20 buy-ins. That’s not terrible, but it certainly isn’t great. By the 5k mark, your chance of losing is a fairly negligible 3%. Things start to look really good at around 6% eROI, though. That’s when you can start expecting losing months to be fairly rare events (if you play about 1k+/month), and longer losing streaks to be extremely rare. So if you can manage to pull off a 2 or 3% raw ROI in these things and you have some form of decent kickback scheme that gives you 3 or 4% more, you can live a pretty nice life playing these silly games for a living. Your analysis are really awesome. Would be really cool if you could do it for the 18mans as well! btw are your stats about turbo sngs? or isnt that relevant? I might do 18-mans. I don’t really know how popular they are, but I’ll look into that at some point. This is about turbos. I imagine that regulars are close enough to the same thing that this would be useful, but I haven’t checked that. Noah, quick question. The Pokerstars 15+1 Turbos have a lower rake than even the higher turbos. They are also littered with regs for this reason.. when considering eroi do you think that its likely that you could gain the 3% or so more making it neccesary to move up past here due to less regs? Basically what I’m trying to say is, how far do you think some skill goes in a turbo in terms of roi, and im thinking not that far. I’m sorry to say that I don’t know the answer. But, you might be able to figure it out on your own. If you play a lot of the 16s on stars, I bet you probably know the screen names of a ton of regs who play both the 16s and the 27s or who used to play the 16s but now play the 27s. Why don’t you think of a representative sample of those regs who have played something like a combined 20k SnGs at each stake (so maybe like 10 guys who have played ~2k each or whatever) and average their ROIs at the different stakes and see for yourself? Don’t forget to add in rakeback at the end, of course. That is a really good idea. I just want to let you know how depressing this article was for me.. I have a 3% roi over about 1100 15+1 turbos so far (before rakeback) and apparently I could be a losing player. Who would have thought 1000 9 man turbos is not a good sample size..
I’d also be interested in 18-mans as well. Awesome analyses. For a guy who’s bad at math, I’m quite the data whore. Keep up the good work. Thanks for taking the time to post this.Very interesting indeed. Pretty awesome stuff – thanks very much!